The last time I dressed in costume was when I cut holes in a bin bag and wore it with a mask. I was ten at the time, it was Halloween, and I was no doubt terrifying. But I otherwise have no desire, whatsoever, to ever dress up for any reason, ever. 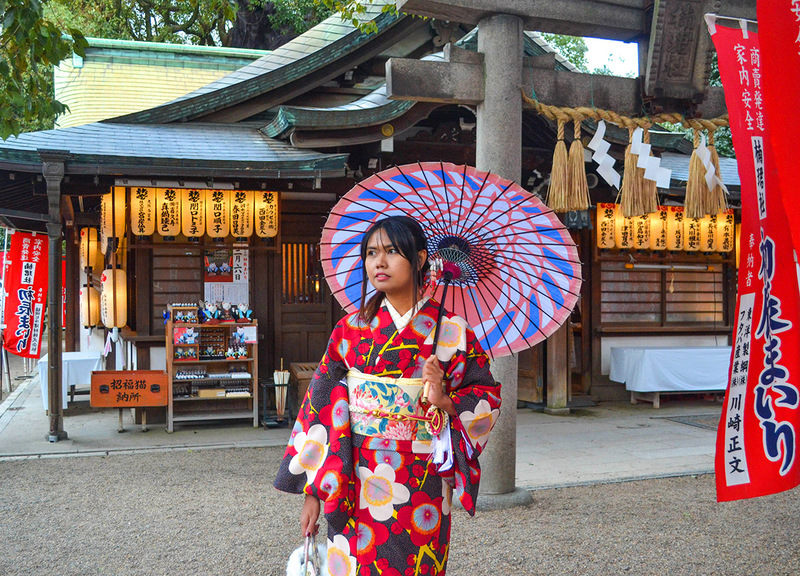 Yet somehow Fanfan convinced me to join her in wearing traditional Japanese kimonos for a tour of Osaka City. 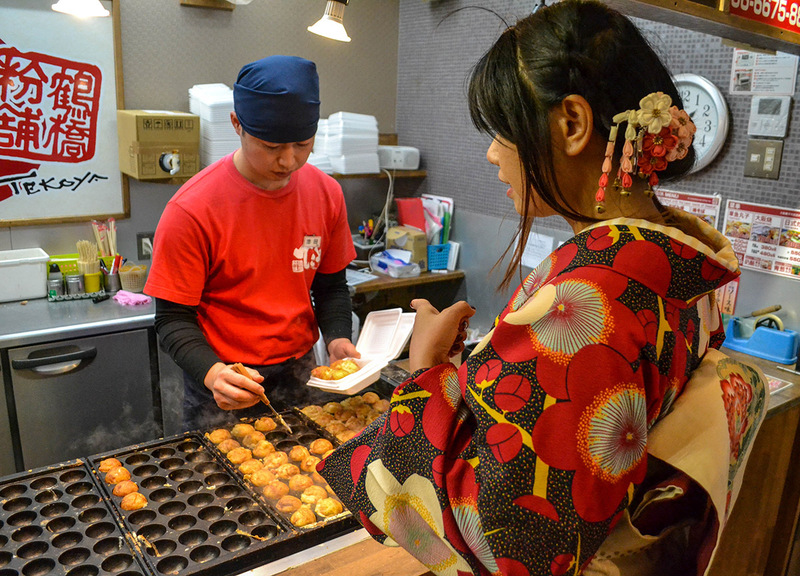 A very unlikely exception put down to my own fascination in Japan and Japanese culture, than anything else. But I admit it was fun in the end, and it made Fanfan happy, which in return guarantees me lots of husband points. Otherwise Fanfan has done similar before where I once followed her on a tour of Kyoto where, coincidentally, we rented our kimonos from the exact same rental company as we do today. They are Kyoto Kimono Rentals Wargo who apparently have stores through all the major tourist cities of Japan, including Osaka, where we are today. 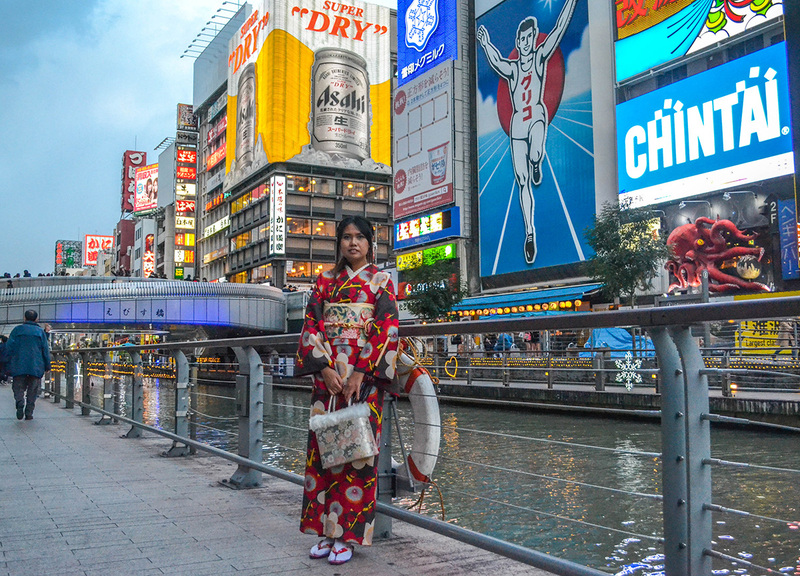 Osaka is one of the less touristy cities, going more with kimono rental, which does make the experience more unique and the photographing less busy. And it starts out from the shop in Shinsaibashi found next to the subway station with a similar name (Shinsaibashi Station, Daimaru Building Minami-kan 2F). This is in fact near the Dontonburi Canal area, and Glico Man at Ebisu-bashi bridge, where a straight walk through connecting arcades leads to find these tourist spots. We start out relatively early on the day, with check-out from our hotel, and have a full day ahead as our flight doesn’t leave Osaka until after midnight. And, fortunately, our bags can be left at the shop during our rental time which is a big perk in itself, otherwise would have been lumbered with luggage through the day. 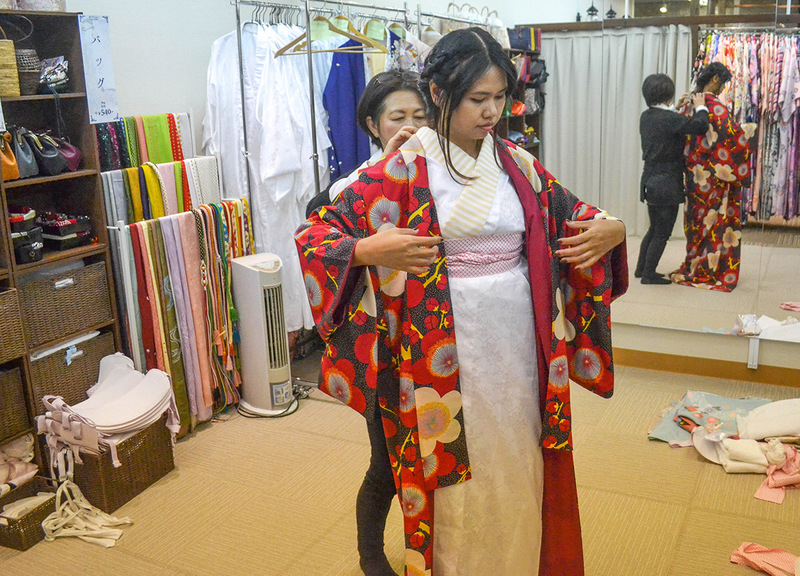 So, at the kimono rental store, we go about choosing our inner kimonos, and our outer kimonos, from the wide range of colours, patterns, and fabrics on offer. 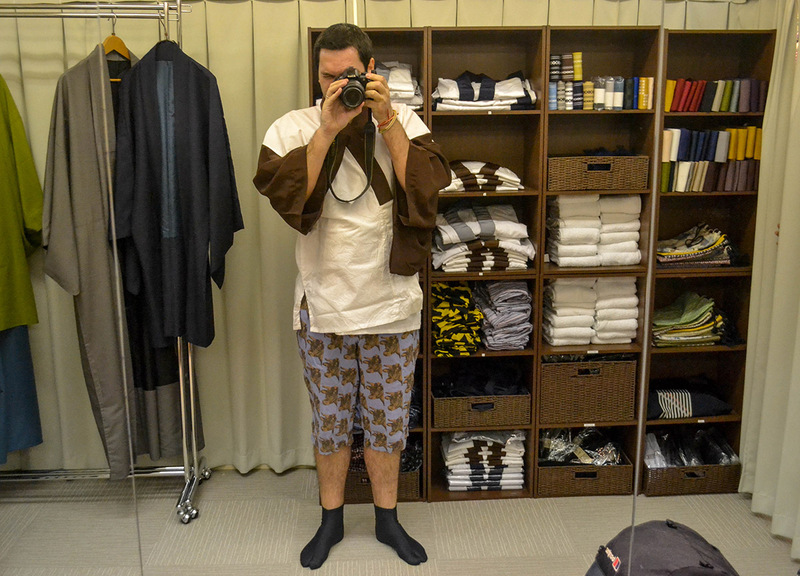 This is easier for men and I personally go for the plainest and least obvious kimono possible as to better blend in. 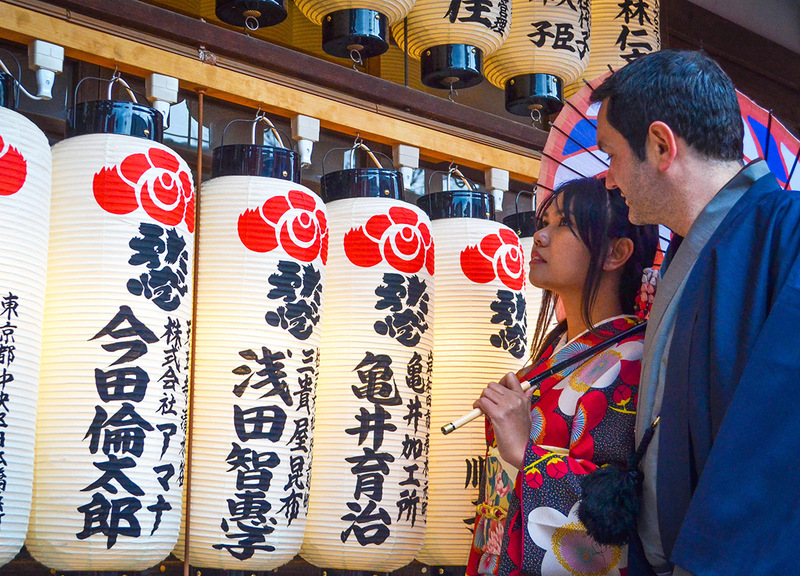 On the other hand Fanfan chooses a brighter kimono, so it would stand out from her previous kimono experience in Kyoto. And she goes with bright red. Her kimono is a whole lot more sophisticated than my own, and involves a lot of wrapping, and preening, as they fix her hair with a kanzashi hairclip, and tie her waist with an elaborate obi belt. There are many options for all of these details, as well as bags where we are also given options of size, where we go big. As we have a lot of cameras and gadgets to carry along with us. Fanfan also grabs a matching umbrella before leaving, to decorate the photos more than anything, as she’s asked not to get it wet. 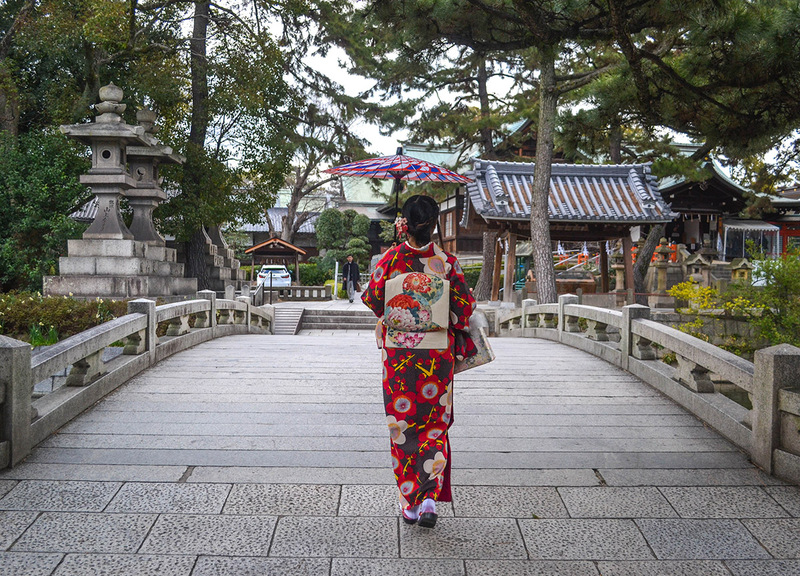 Umbrellas are more for sheltering from sun, than fending off wetter weather, and our kimono rental is in the freezing winter time. 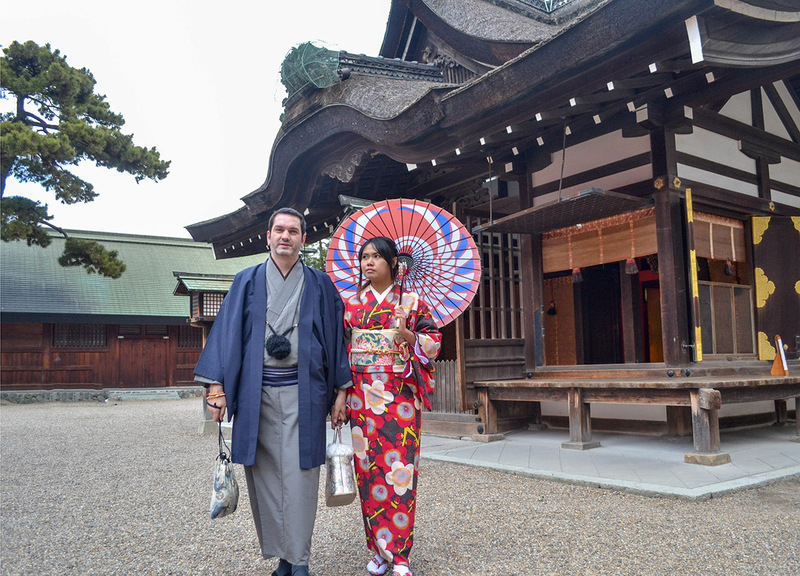 At the door we are given options of traditional zori shoes before being let loose in Osaka. I remember it how frustrating it would be setting up photos in Kyoto, where every popular tourist spot is pretty much guaranteed to be busy with tourists. I remember it took near 30 minutes, and a fair bit of photoshop, to pull off one decent photo at the torii gates of Inari Shrine. It was a fantastic photo, but I am thankful it is now done, as these photos now will be more relaxed and intimate. As, from our last shoot, we found the more local shots, always turned out better than the “standing in front of a tourist attraction” shots. So instead of rehashing the popular tourist spots of Osaka we instead opt for a lesser known temple in Sumiyoshi Taisha Shrine (next to the Sumiyoshi station) which is quiet and serene when we arrive, and easy to photograph. As it would be harder today given we both would be in the shots and this needed a tripod, a camera set on timer, and quite a bit of patience. And we easily put together a quick photo session, and Fanfan now has potential profile pictures to last her years. 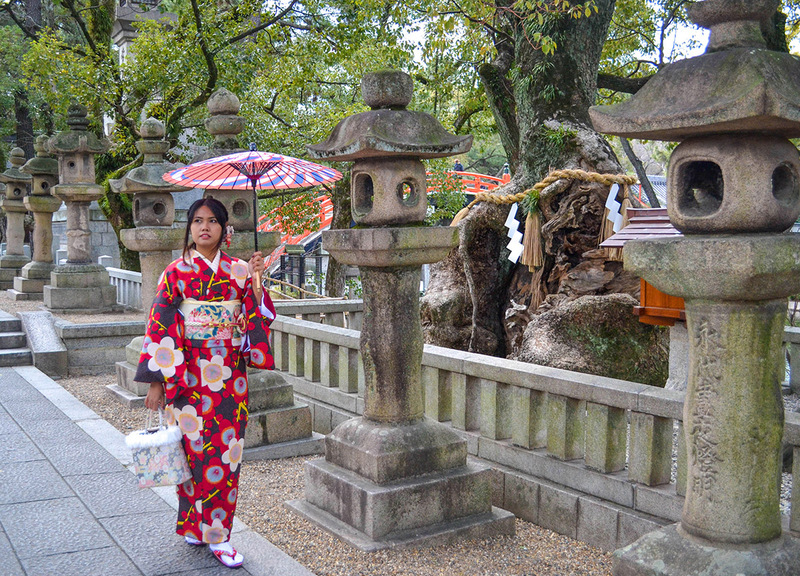 I then opt out after Sumiyoshi Taisha Shrine but continue to photograph Fanfan around the city. 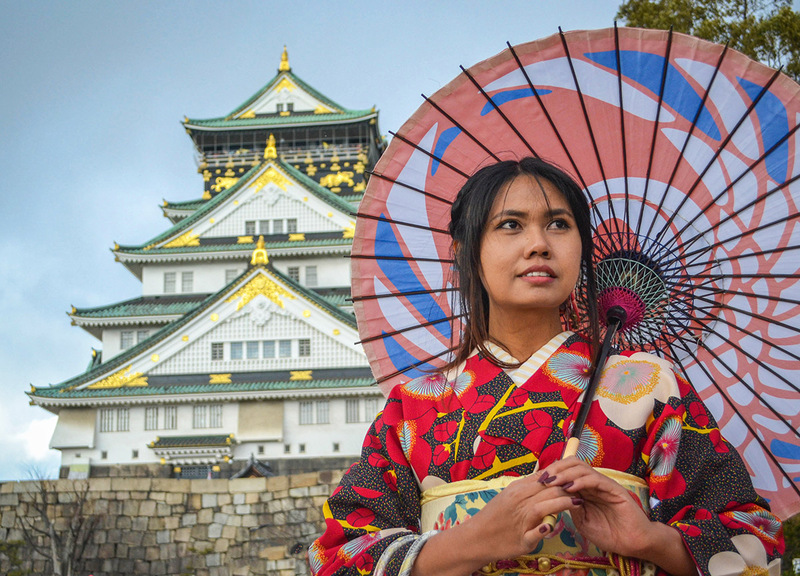 This is in fact our third visit to Osaka, so we have covered much of the main attractions in the past, although we do revisit the more iconic locations, like Osaka Castle, where it became ridiculously cold. We were more or less standing at the top of the hill, when winds picked up and snow started falling from the sky. The winter months can be a bit nippy for kimonos, although suitable seasonal options are available in store, which we didn’t bother with at the time. As it is otherwise warm enough to explore the more sheltered locations. So, after a few shots at Osaka Castle, we inevitably move back to the sheltered streets and arcades of Namba and Dotonburi Canal. An area which I actually prefer to photograph. But we do have a lot of time left to explore so we find ourselves doing normal things, like shopping in the duty-free shops, and eating, and we spent a good thirty minutes queuing for ramen at Ichiran Dotonbori. Admittedly we do look a bit out-of-place throughout where we almost become the tourist attraction in ourselves. 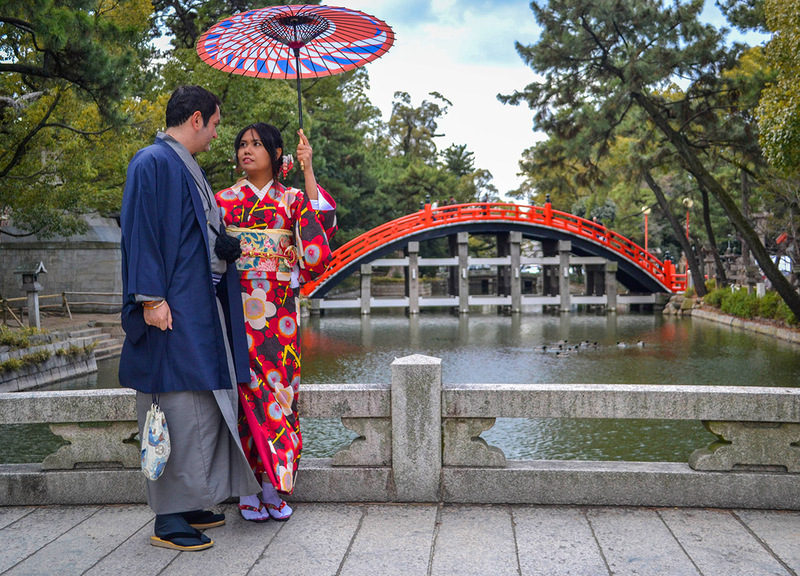 But this is because so few people actually dress like these days and most tourists opt for kimono rental in nearby Kyoto.